Αυτό είναι το Volvo V40 T5 HPC της Heico Sportiv το οποίο φορά τον 2,5-λιτρο turbo κινητήρα, ο οποίος δυνάμωσε και αποδίδει 320 άλογα με 510 Nm ροπής. Με μερικές επιπλέον βελτιώσεις (ψεκαστό σύστημα μεθανόλης) αποδίδει 350 άλογα με τα 0-100 χλμ/ώρα να τα κάνει σε 5,6 δευτερόλεπτα με τελική ταχύτητα 265 χλμ/ώρα.Είναι τετρακίνητο και φορά σπορ χαμηλότερη ανάρτηση κατά 30 mm, ζάντες 19″ με ελαστικά 235/35 και εξαπίστονα φρένα με δίσκους 370 mm. Στιλιστικά φορά νέο bodykit κατασκευασμένο από ελαφρύ πλαστικό πολυουρεθάνης, και στο εσωτερικό υπάρχουν καθίσματα της Recaro, σπορ τιμόνι, νέα πεντάλ, καθώς και λαβή χειροφρένου και επιλογέα ταχυτήτων επενδυμένα με Alcantara. Το αυτοκίνητο όπως το βλέπεις στις φωτογραφίες δεν πρόκειται να περάσει στη παραγωγή. Η Heico Sportiv άφησε ανοικτό το ενδεχόμενο να το περάσει στη παραγωγή, μόνο αν υπάρξει η απαραίτητη ζήτηση. Ωστόσο μερικά μέρη του, θα είναι διαθέσιμα προς παραγγελία μέσα στους επόμενους μήνες. 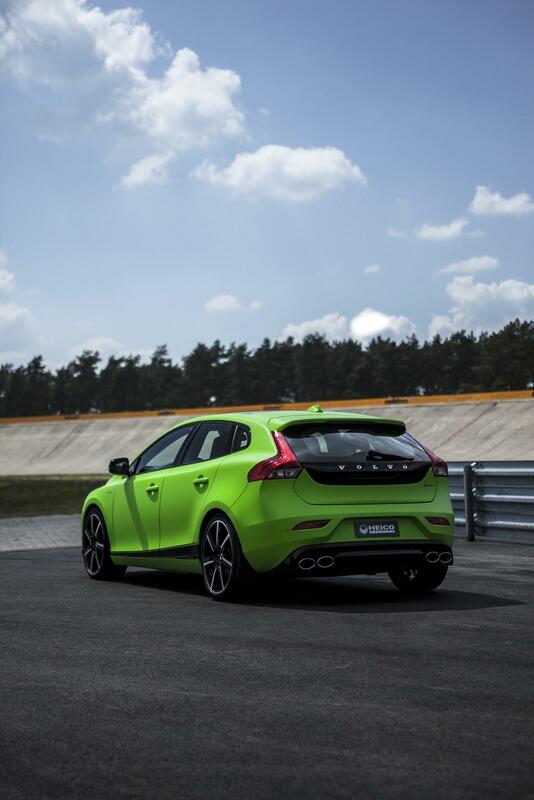 Weiterstadt – HEICO SPORTIV shows what’s technically possible with the Volvo V40 T5 HPC. 350 hp, 4-wheel drive and extremely dynamic driving characteristics are the ingredients that make the sporty compact car an interesting alternative to the Audi S3 Sportsback, BMW M135i xDrive and Mercedes A45 AMG. 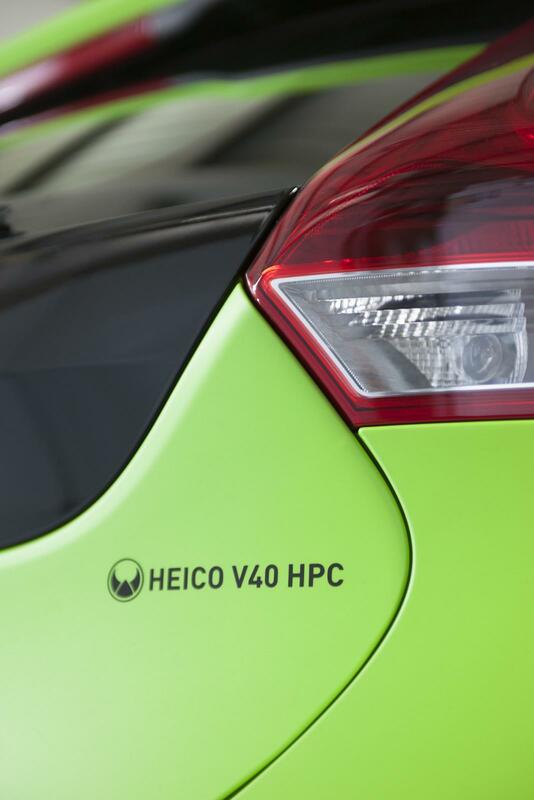 The abbreviation “HPC” has a long tradition at HEICO SPORTIV. In 2007, the Volvo tuner presented the “High Performance Concept” based on the Volvo S80 T6 at the Las Vegas SEMA Show. At the time, the specification of customer, Volvo Cars Corporation, had just one requirement: maximum performance without compromising any safety feature or Volvo’s iconic durability. The powerhouse is a redesigned, 2.5 liter cubic capacity, 5-cylinder turbo engine. Compared to the series-produced engine, the turbocharger, exhaust system (including sport catalytic converter and flap control), intercooler and charge-air system have been fundamentally revamped. The performance kit is rounded off by the HEICO SPORTIV performance enhancement system, e.motion®, and the new HEICO SPORTIV speedpack for increasing the top speed before the series-produced speed throttle kicks in. 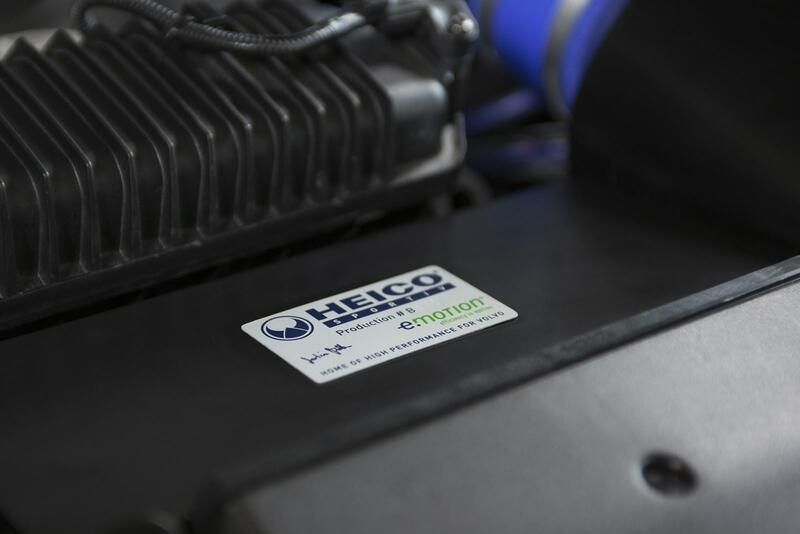 Maximum power increases from 187 kW (254 hp) to 235 kW (320 hp) and, when the water-ethanol injection system is activated, to as much as 257 kW (350 hp). Torque is boosted from 360 Nm to 510 Nm. The water-ethanol injection system is activated with the illuminated HEICO stainless-steel button in the central console. Level 1 (green) is the standard setting for 320 hp; level 2 (blue) opens the exhaust system flaps; level 3 (blue, flashing) additionally activates the water-ethanol injection system. 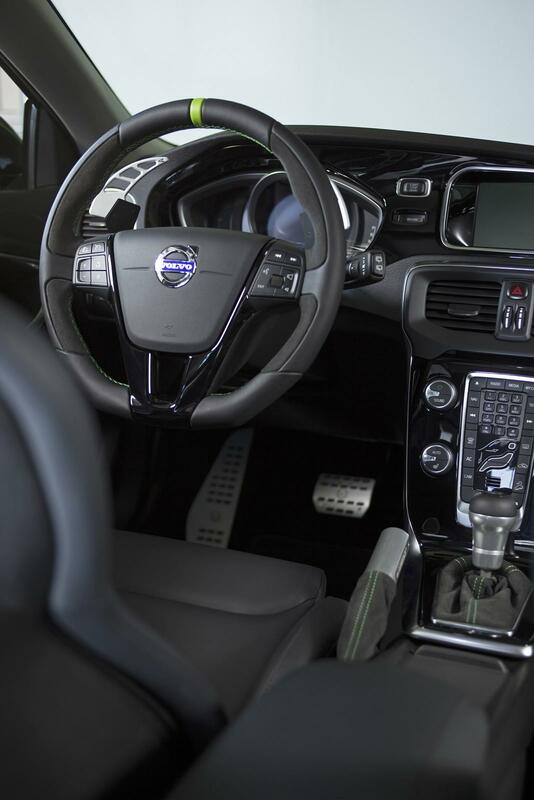 In this mode, the Volvo V40 T5 HPC accelerates to 100 km/h in 5.6 seconds and reaches a top speed of 265 km/h. 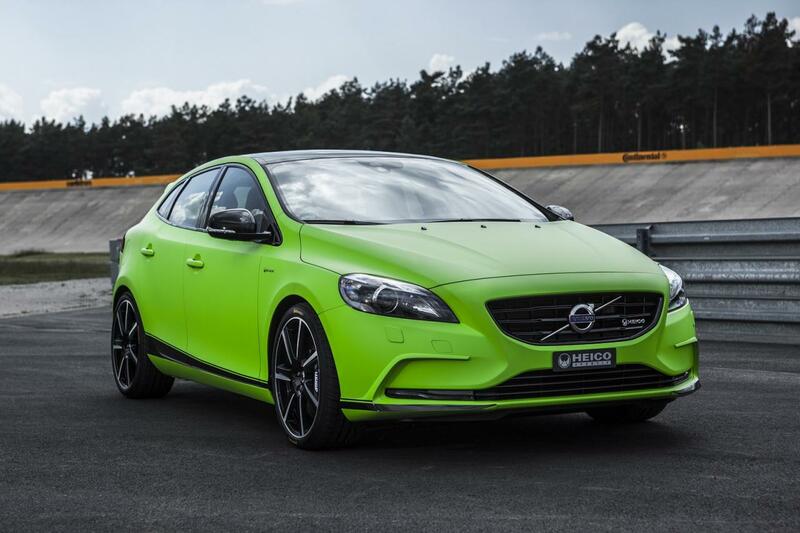 With these specifications, it’s safe to say the HPC is probably the world’s fastest and most powerful Volvo V40! One of the main strengths of the Volvo V40 T5 HPC is its dynamic driving characteristics, achieved through the HEICO SPORTIV sport suspension consisting of specially harmonized sport shock absorbers and sport springs for the front and rear axles. Reduced vehicle inclination when accelerating from standstill and braking result in precise handling, and optimized braking performance and traction. The lowering of the vehicle by ca. 30mm, and consequent sinking of its center of gravity, make the car’s excellent driving dynamics palpable. A special cross-brace and the 235/35R19 ContiForceContact cup tires mounted on the 8×19″ weight-optimized designer wheel VOLUTION® VII. Diamond-Cut Black, are another factor contributing to the superior driving dynamics. The six-piston sport brake system makes a further, major contribution to driving safety. The 370mm diameter brake disks are perforated for better response characteristics in wet weather and have a highly efficient cooling system. It guarantees a precise action point, outstanding stability and significantly shorter braking distances. The series-manufactured automatic gear transmits power to all four wheels. In doing so, fixed paddle shifters integrated into the rear of the HEICO SPORTIV sport steering wheel have been used for the first time. 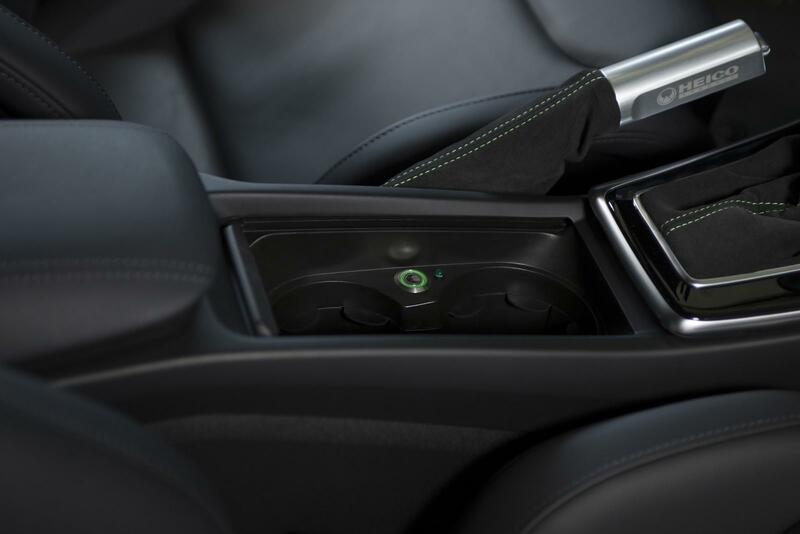 The benefit is patent: at all times the driver can actively intervene in the transmission control without having to remove his hands from the steering wheel. 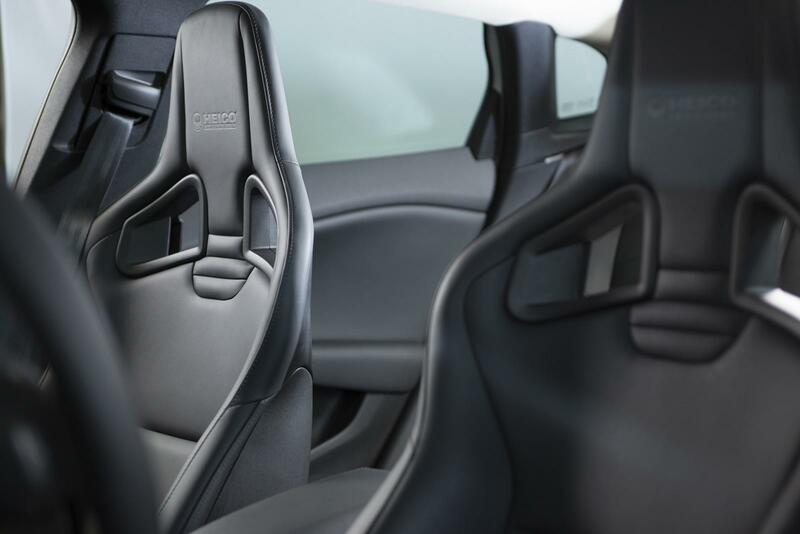 Combined with the Recaro body-contoured sport seats – with specially constructed seat consoles – the driver and co-driver have an optimal sitting position with perfect side-support. 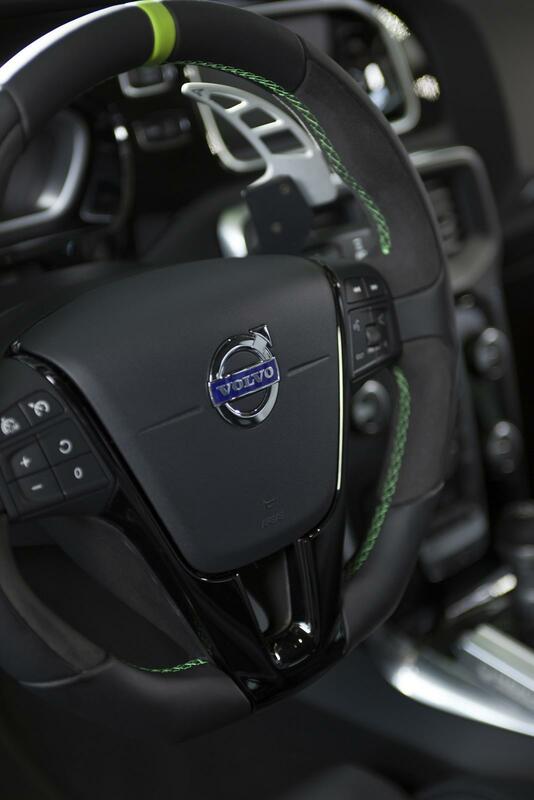 Inside, the top-quality, series-produced interior has been further refined: the seats and door paneling have been re-leathered, the sport steering wheel, gearshift and handbrake grip are adorned with green stitching. 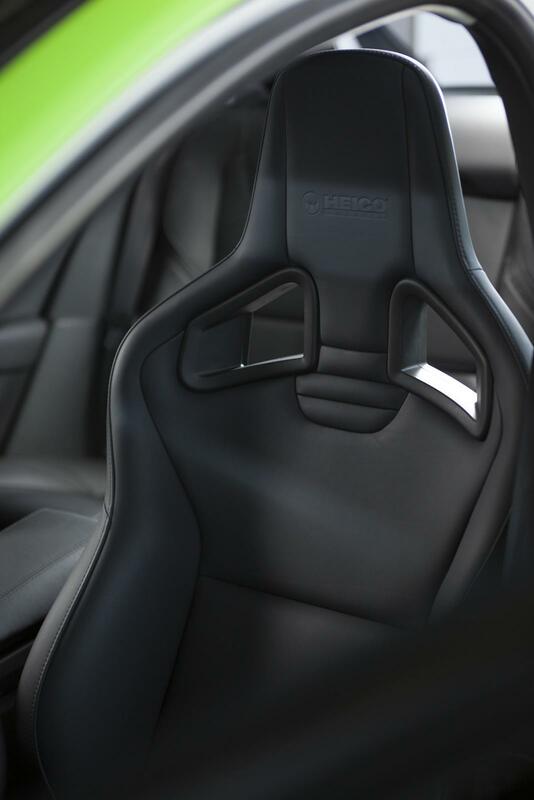 The gearshift and handbrake collars are made of Alcantara. The tachometer cladding, free-floating central console and steering-wheel inlay are in piano black, and the aluminum pedal set, footrest, fine-velour foot mat set and black anodized, illuminated stainless steel door sills originate from HEICO SPORTIV’s standard product range. Outside, the Volvo V40 T5 HPC makes no attempt to be coy. The first striking feature is the iconic HEICO SPORTIV body kit, consisting of a front spoiler and rear skirt in diffusor look. The BodyKit is made of lightweight, flexible polyurethane plastic (PUR-R-RIM) and fulfills all safety standards, including pedestrian protection. The entire vehicle is covered in a Matt Toxic Green film, offset with black, lateral decorative stripes.